We slept in a little bit that morning, we didn't have much planned and also we had to look for a last-minute lodging between Höfn and Snæfellsnes as our cabin in the West only starts the day after. I was looking at either heading back to Hvolsvöllur or the nearby towns of Selfoss/Hella. I found a pretty awesome listing on Booking.com for this farmhouse stay that looked pretty promising and we decided to share the booking with my friends Raenor, Joel and Rupert. They had 4 Double Bed rooms on the upper level, a pretty roomy living area and the kitchen/dining area on the ground floor. It was perfect for the 6 of us and we booked it, checked out of the hostel, stopped by the supermarket in town, got a couple of hotdogs (legendary btw) and were off towards Skaftafell for our hike. We stopped by a couple of spots during the journey, one to Jökusárlón for the morning light and breakfast, the other on a hunt for a lighthouse that we couldn't find. But we did chance upon a charming little toilet in the middle of nowhere. There are a couple of hiking trails at Skaftafell, we chose the 2hr one as we weren't prepared for a long trek, but i might head back again for the 10-20km hikes someday! The trail starts next to Skaftafell Visitor Centre and is well indicated. The first 250 meters go through the campground but the trail then turns right and uphill. Follow the signs until you arrive at a viewpoint above the waterfall (140 m ascent in 1.5 km). Continue down into the ravine, across the footbridge, and climb up the basalt column steps on the other side of the ravine. Continue on this trail to the viewpoint at Sjónarnípa, then head back towards the old turf house at Sel and then back to the visitor centre via Lambhagi. We arrived to the farm around evening and the owner was kind enough to show us around the house and also a little history about the place, it was the house that he was raised in and there is a stable out back with his horses that he rides in the highlands during summer. Made dinner and had an early night that day, I wanted to wait for the night to fall to catch some stars but it was just way too bright so near to May. For Day 6, we stopped by Vík for petrol and also a Bónus on the way up to the West for groceries for the next 2 days in the Cabin. But it was mostly driving that day, we didn't really make any stops. We did have an interesting experience going in the tunnel that went under Hvalfjörður, the toll costs 1,000 Kr ($11) for one way in but saved us an hour from going around it. 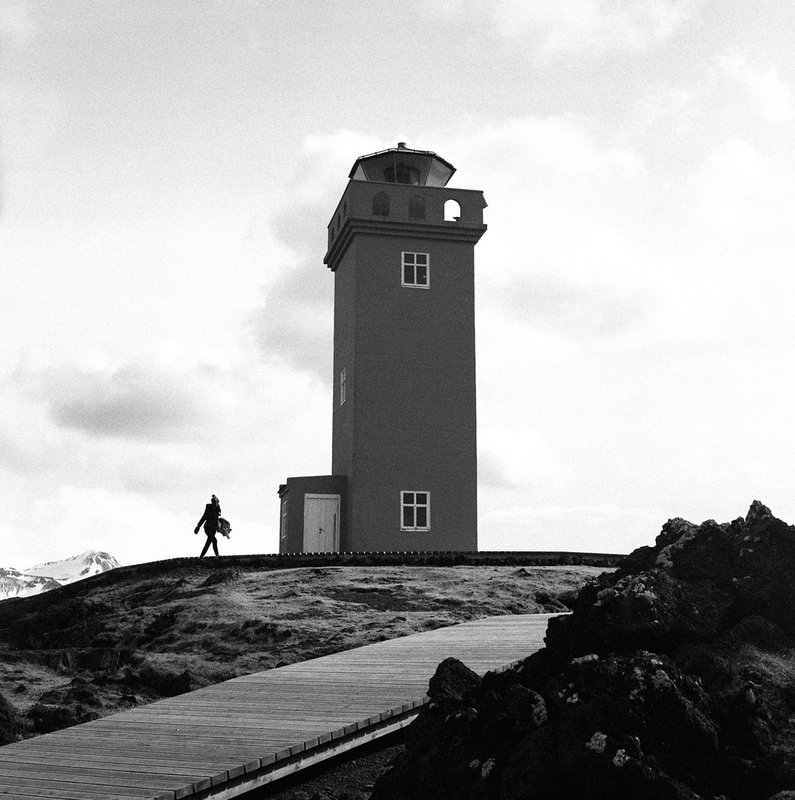 Once we've reached the Snæfellsnes peninsula, the beauty sunk in. My favourite route to drive was Route 56, the roads went up, down and winding through the snow covered mountains and also through some beautiful farm land towards Grundarfjörður, where our Airbnb Cabin beneath Kirkufell was. We were really excited for this cabin, hot tub, in the middle of nowhere underneath an iconic Icelandic Mountain that landscape photographers love. The cabin is almost always in the shot. Here are some shots during a couple of stops we made. We reached the cabin and it was true to its description, mostly wood, a lot of hand-built furniture, No Wi-Fi (which was alright we had 3G and mostly travelling), nice little kitchen and 2 rooms with bunk beds. It was here that i noticed a particular mountain that i said i wanted to name my future daughter after, Mýrarhyrna, Mýra. Beautiful mountain, beautiful name. I wanted to wait for the sun to set to take some landscapes but the sun never really did set. We started off day 7 with a soak in the cabin's hot tub, with a view of Kirkjufell. Janelle and Haziq were slightly apprehensive about stripping in the cold for this but i assured them it would be beautiful. I kinda like the piercing cold of the winds in the morning, perks you up and the soak that follows would relax you right down. The sun was beautiful too, a great combination with the 7 degree weather. The agenda for the rest of the day was a tour of Snæfellsnes, starting with Dritvik Beach, Djupalonssandur, Svörtuloft Lighthouse and bird cliffs, Hellnar-Arnarstapi Hike and lastly the Saxholl Crater that we happened to chance upon on the drive back to our cabin. In this area surrounded by volcanic rock, you can find the remnants of a shipwreck from the 40s laid across the entire beach along with lifting stones which were used by fishermen back in the day to test their strength and qualify them for work on the fishing boats. The stones are named; Fullsterkur ('full strength') weighing 154kg, Hálfsterkur ('half strength') at 100kg, Hálfdrættingur ('weakling') at 54kg and Amlóði ('Useless') at 23kg, and fishermen had to lift at least the 'weakling' stone to hip height to be eligible. I tried the stones and only managed the 'Weakling' stone up till chest level. Heavy stones indeed. Now we haven't had much luck with lighthouses because they are always so out of the way to drive so we were pretty excited to visit the Svörtuloft Lighthouse by the bird cliffs. I remembered a driving onto the turnoff from the main road into this one lane path in a valley of volcanic rock and eventually seeing the lighthouse from afar. The silhouette stood out from a distance away. Hellnar-Arnarstapi Hike, now we only walked up the route for like 10-20 mins because we were getting tired by then and didn't fancy a hike but it had a beautiful view nonetheless, also we managed to see a giant whale from afar in the ocean just chilling around surfacing every couple of minutes, it was too far for photos though. We called it at day after Hellnar and was heading back towards the cabin at Kirkjufell when we chanced upon a road that leads to this little crater and had to check it out, i drove up to the description sign and read about how we can climb it. I remembered mixed feelings in the car about climbing it but some fear of heights got to be conquered. The Saxholl Crater. After Snæfellsnes, we packed up the next morning and left for Reykjavik for our last night before a 6am flight back to Helsinki-Singapore. I would've liked to explore the city a little bit more if we had more time but we only managed a meal at Icelandic Fish & Chips and walk along the harbour which was pretty sweet. There were many things we wanted to do on the trip that we could not, due to the weather and also the month that we went (off peak, ice melt) but in winter there will be ice cave visits and other cool stuff, for summer you can go up into the highlands and visit Landmannalaugar. But even then the pure beauty of this country was enough to satisfy for this trip and entice me for a few more down the years. Some tips that i have for Iceland? - Rent a Car (4x4 will be effective if you're planning to visit the Plane Crash site), fill up that car so costs can be shared along with Airbnb for your lodging preferably those with kitchens and bring some ramen or buy groceries and cook your meals. - Biscuits and jam are good on the road, leave your Haribos overnight in the car and when they become solid gummies they are insanely effective at keeping you awake for all them long drives. - Have some fish & chips in reykjavik, pretty good! - Bring some plastic covers for your cameras when you're near the waterfalls, or at least a handy cloth after that to wipe it down because it WILL be wet. I cant think of much more but if you guys have any other questions feel free to drop me a message. That's all folks! hope you've enjoyed the photos here.